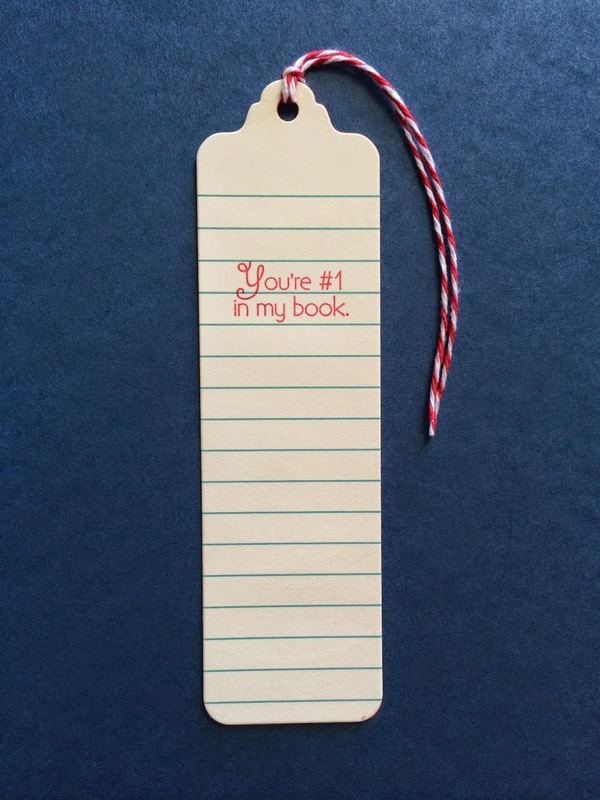 Back again today to share another bookmark! CAS has always been my favorite--I love the impact of a simple design. 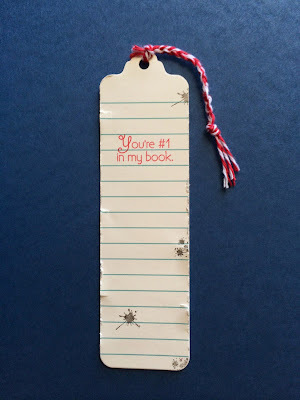 Today's bookmark I used some lined paper with a cute sentiment from Way to Go Kiddo (I just love that name! 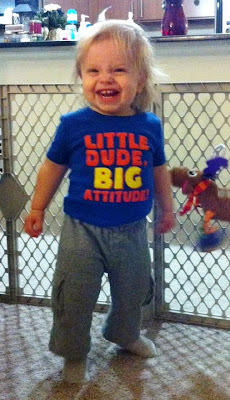 And I call Alexander kiddo too!). I made it into a double sided bookmark and embossed the back using a PTI impression plate to give it some dimension and interest. And it's been awhile since I posted an updated pic of Alexander--here he is dressed up as a chef! That's all for today!! Have a wonderful sunny day! Sorry I have been MIA recently! Life has been completely crazy. I am never giving up on crafting or blogging though so I do hope you'll continue follow me when I am able to post. 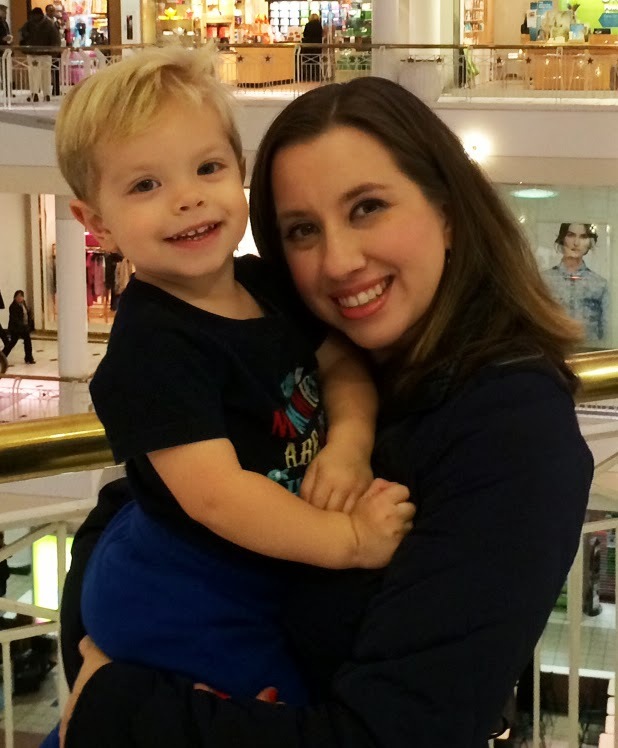 I've really missed my blog friends and posting! Last winter I put a few of my handmade things for sale in a store in the mall. It was a lot of fun and it got me crafting again. This set is one of the things I made and it sold almost right away (so sorry I couldn't get a better pic). I'll be posting some of the others over the next few days. I love the PTI Simply Jane set, but hadn't really put it to use. It's such a unique set and I love to read so it's one of my favorites. I used the Simply Jane paper and dies to make a notebook, pen and bookmark set. I rolled up one of the patterned papers inside the pen to coordinate and used the bookmark die (one of my most used dies) to finish the set! I saw the cool embossing technique Danielle was sharing for Make It Monday and decided I had to play along this week! I thought the gold gilded edges had a painterly look to it, so I randomly added it to the edges of this tag to look like an artist in the process of painting. This could be a tag you add to a handmade item or art project or even a kid's project given as a gift. 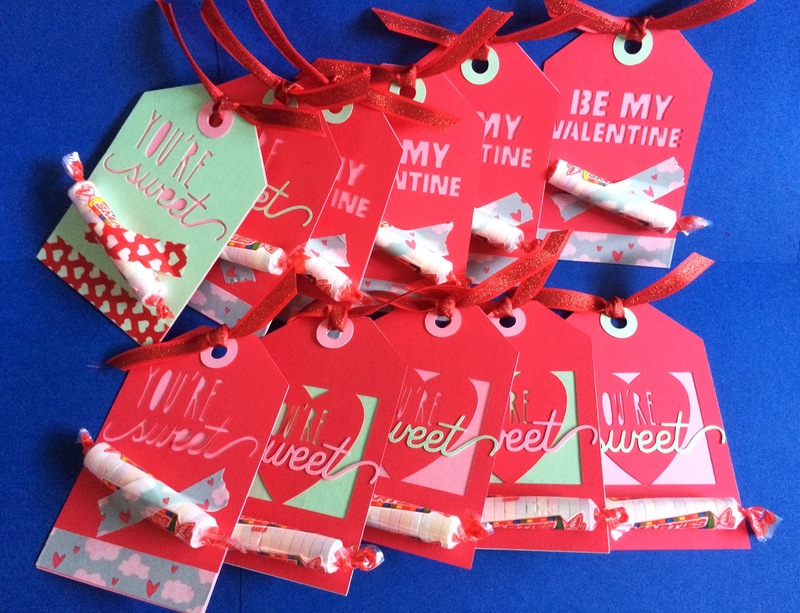 I made the tags in a couple of different sizes. The tags are from the Tremendous Tags die set by PTI. 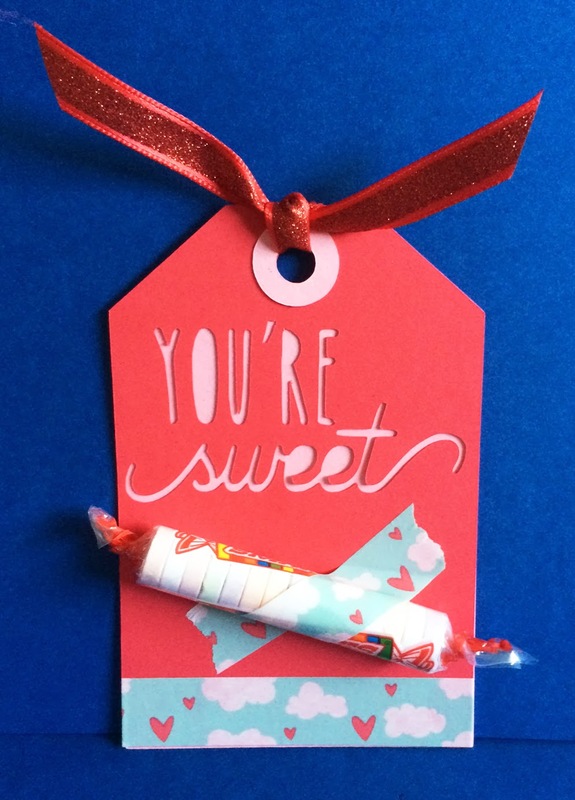 The sentiment is from Friendship Jar Fillers stamp set. Heat embossing is one of my favorites and doing this technique, reminds me a little of the sprinkle embossing I did on this card here. I really like the look and can't wait to try it again. 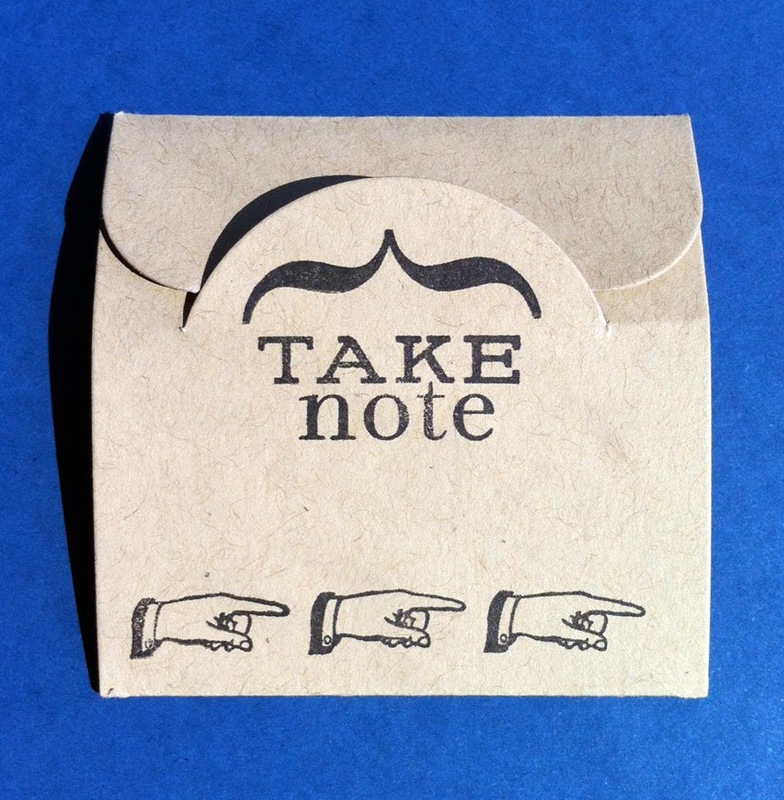 I also made some using PTI kraft paper and Chai inked edges. I've been making a bunch of crafts lately for craft shows and also just started displaying and selling my work at a new handmade store in the mall called Unique Designs, which I'm really excited about! It was fun incorporating this technique into the designs. As I promised in the last post, these are the all of the individual floss matches I found for the Papertrey Ink felt colors that I currently have. I backstitched the thread into the felt to get a better idea of what it would look like on the project. If you click on the image you can see it enlarged. And I'm still looking for a good match for Winter Wisteria if anyone knows of one! 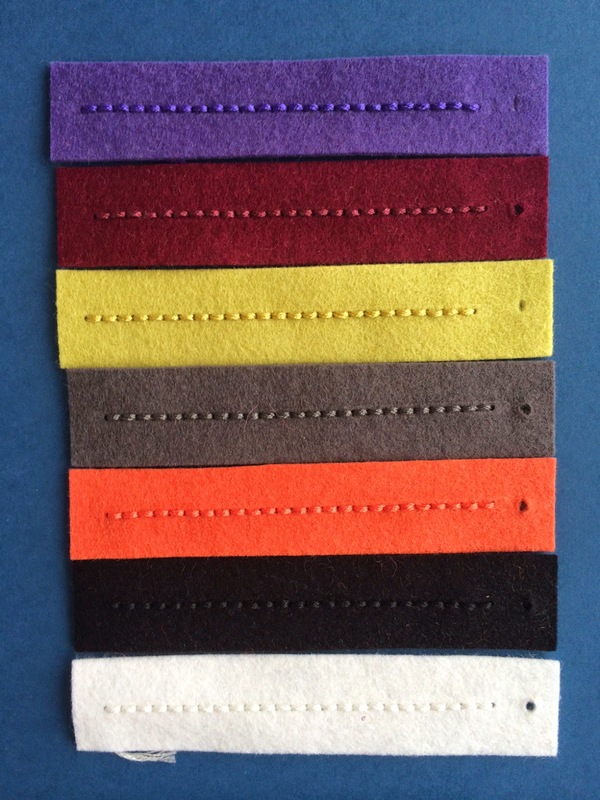 And here are all the felt colors and DMC thread in one pic. I poked a little hole out of the top of each felt sample and put it on a ring. I've been referring to it often. I also didn't trim the thread off after I sewed the stitch on so that I would have a loose string hanging off the back to also use for reference. The Apple app store has an app called, Thread Tracker, that can keep track of all your DMC floss colors so you know which colors you have when you're at the store or out and about. I've found it to be pretty useful and definitely recommend it if you have a lot of floss. I hope this is helpful and makes it easier to find floss colors that match. I'll update this post as I get new PTI colors of felt or new DMC matches. Thanks for stopping by! 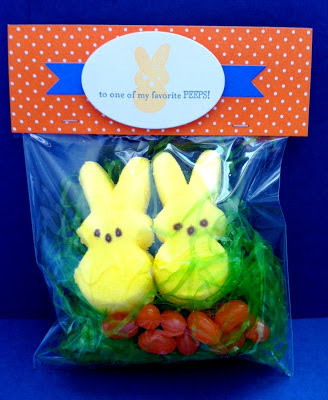 Springtime Bunny Coin Purse + a few tips! Spring is finally here and I got inspired to make a springtime bunny purse! Papertrey Ink has released the best stitching dies and it has been so fun to do some hand stitching and make coin purses. To create the hopping stitches, I taped a cut out stencil of the PTI Birthday Style confetti dies to the coin purse and used the negative as a stitching guide. (And then I'm using the positive cut outs of the confetti lines for another purse.) This technique could probably work with a lot of other dies too. The zipper is a 4 inch Mango Smoothie zipper from the Etsy shop that Erin Lincoln (who designed the dies) recommended here: https://www.etsy.com/shop/zipit. 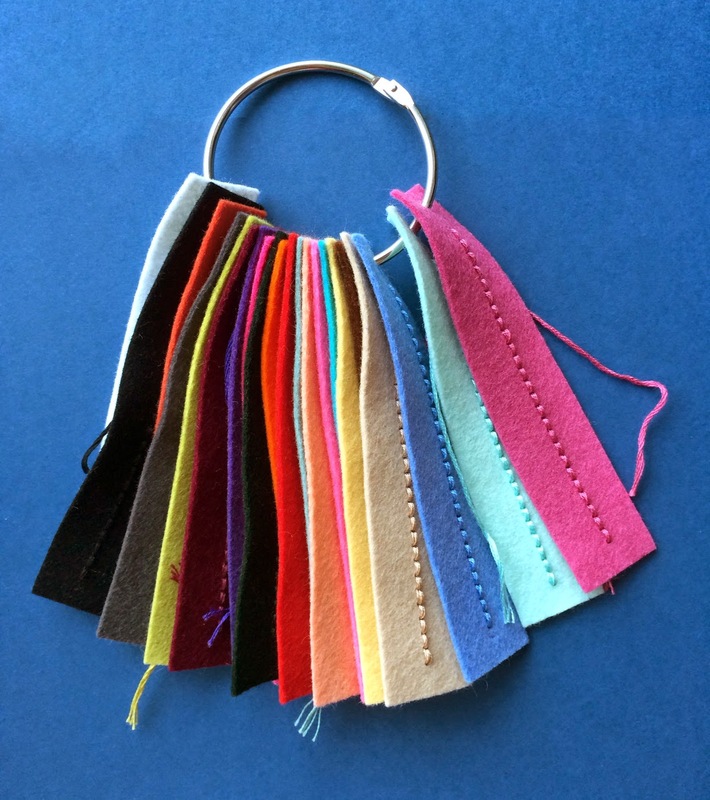 It is so fun to stitch in zippers of all different colors! I also used Erin's tip to add fabric tape to the inside of the purse to hide the zipper stitches. It's a cute addition, and you just have to be careful to apply the tape so it doesn't buckle. 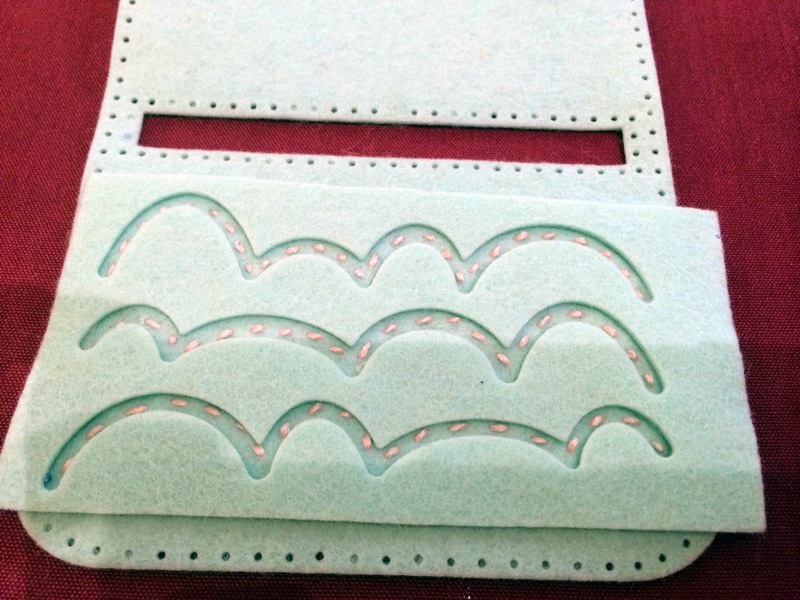 At least for me, there has been a learning curve for these purses and I thought I'd share a few tips for stitching the coin purses that seemed to work. Fortunately, it does seem to get easier as you do more purses. 1. To backstitch around the 4" zipper uses about 4 feet of floss. 2. It's easier to use a thin strip of sewing tape to attach the zipper then pins. It keeps the zipper in place and aligned and is much more pleasant to stitch. Just avoid putting tape under the actual stitching holes. 4. Stitch vertically, not horizontally. You have more control if the stitch is facing towards you. 5. Stitch and pull slowly and gently, not only to avoid tearing but so that you have more control over how the stitch looks. 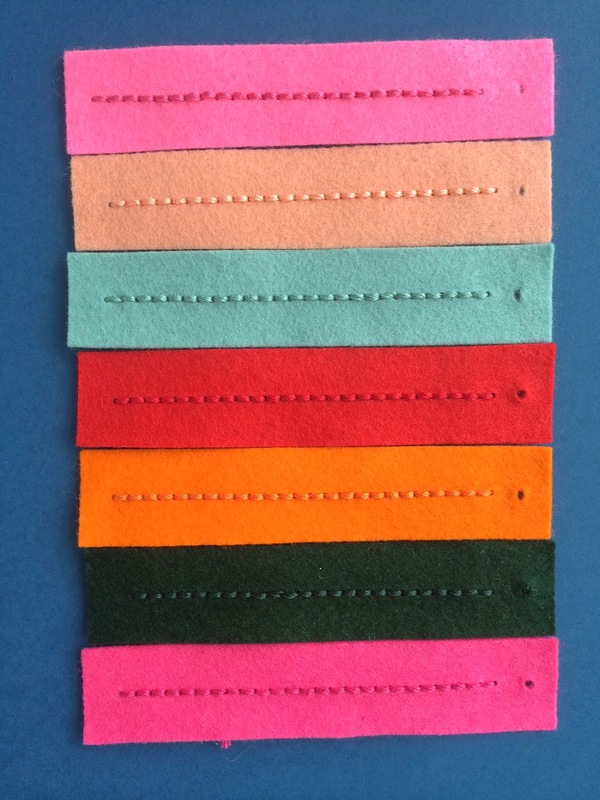 To make things a little easier, I also made a swatch ring by cutting a 1 inch swatch of each PTI felt color and diecutting a stitch line to use as reference when making new felt/floss projects. I took the felts swatches to the craft store and found some good DMC floss matches for the PTI felt colors. 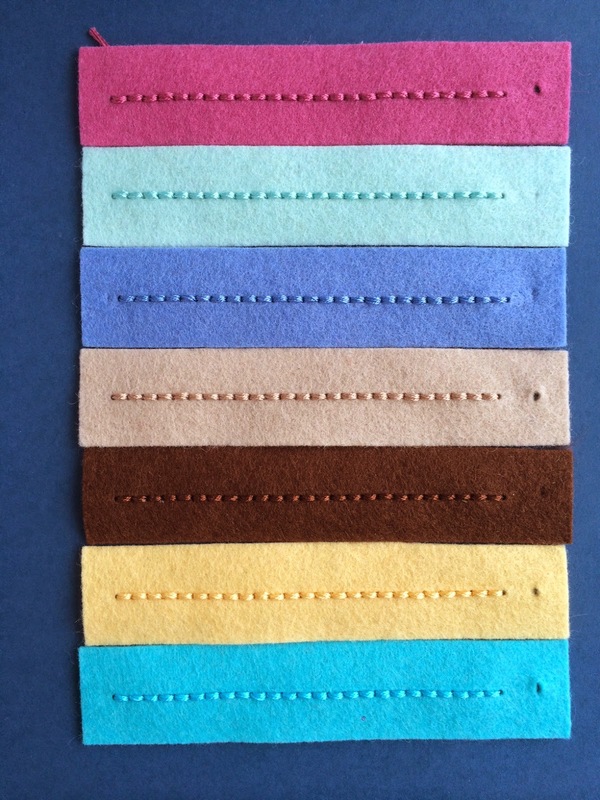 Some of the felt colors vary from their cardstock matches, so it was helpful to find new matches with the felt. 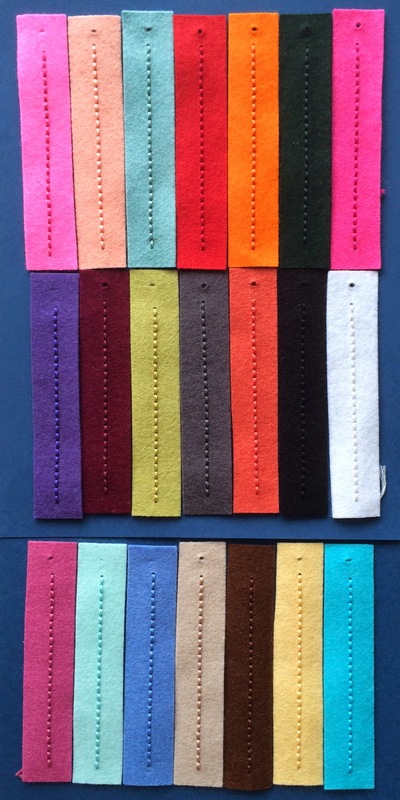 I will list the felt color matches and show pics of the floss and felt matches in my next post! I made these note holders awhile ago, but realized that I never posted them. 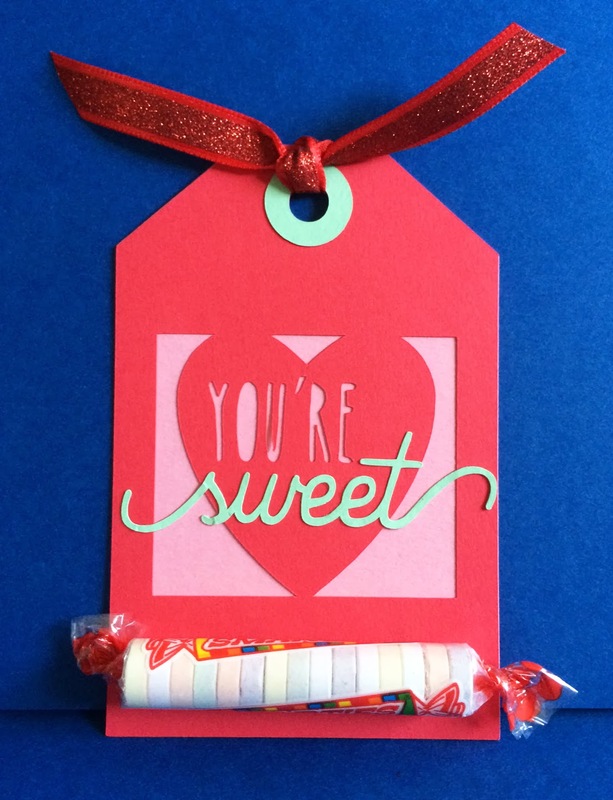 They are super simple but fun to make, and they work great slipped inside your purse or bag. I cut these note holders out using Papertrey Ink's lunchbox note die (if you have been to my blog before then you might know that it's my favorite PTI die! ), and then I stamped a simple design using PTI's Take Note stamp set. 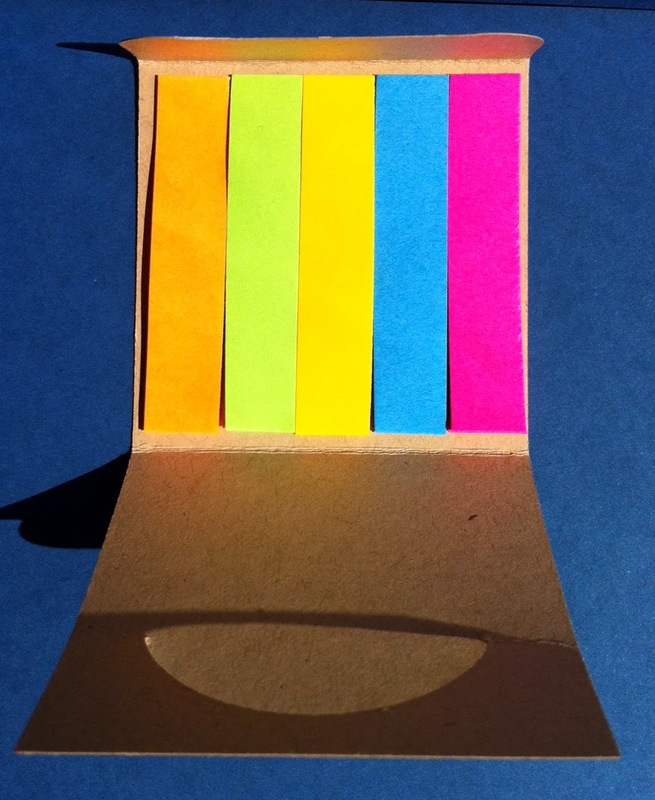 For the inside, I cut strips of post-it notes to fit inside, and there are 12 notes of each of the 5 colors (12 is the most that my trimmer can cut at one time, and the ideal amount before the lunchbox note gets too thick). The measurement of each strip is 1/2" wide x 2-1/2" long. You could also make them a bit wider and include just a couple of colors instead. 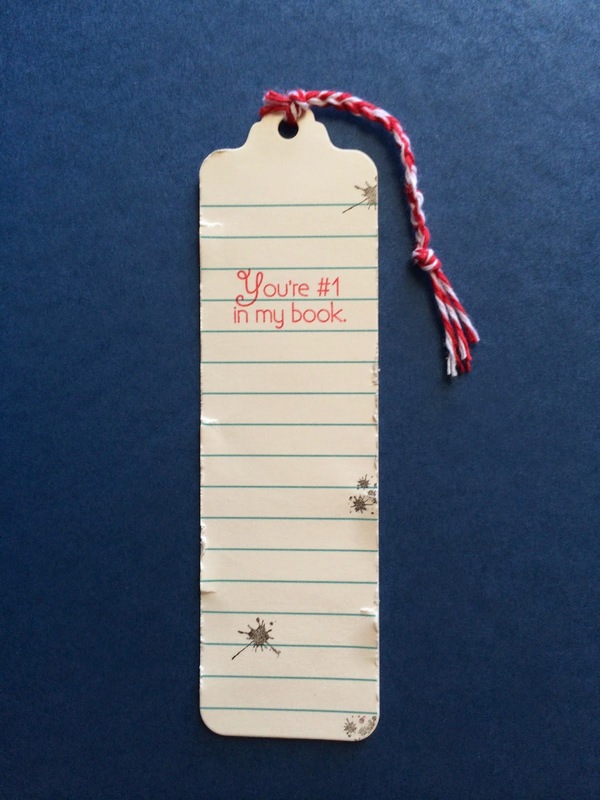 These can be used as bookmarks, reminder notes or tags. That's all for today. 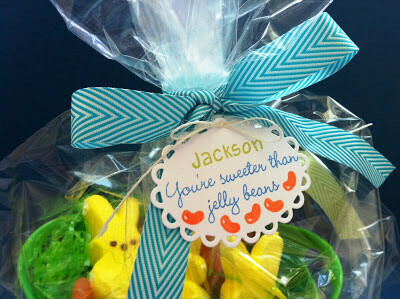 Have a great and sunny (and soon to be Spring) day! 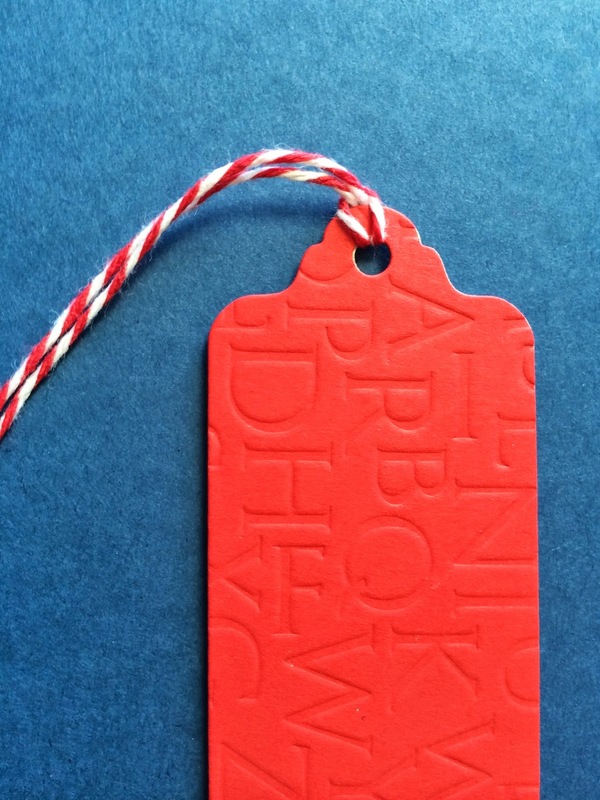 You might notice that there isn't any stamping on the tags. I love to stamp, but I got a Silhouette machine and it has been getting a lot of use. When you have a two year old running around everywhere, then minimizing materials, time and clean up is so important. Using the Silhouette helped me to start crafting again, when I went through a time that I worried I might never craft again. 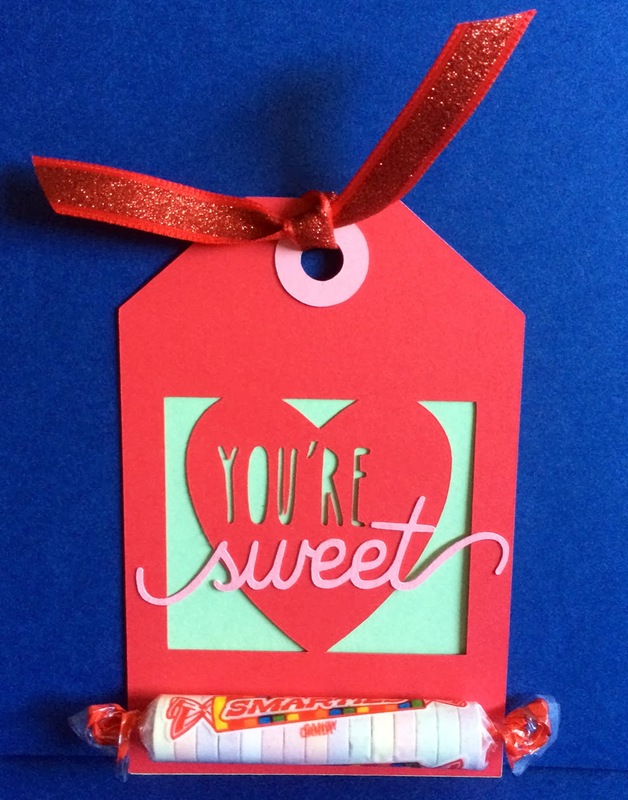 I will still post projects using stamps and dies too, and many will also now use the Silhouette. I cut out a variety of tags. Here's another. 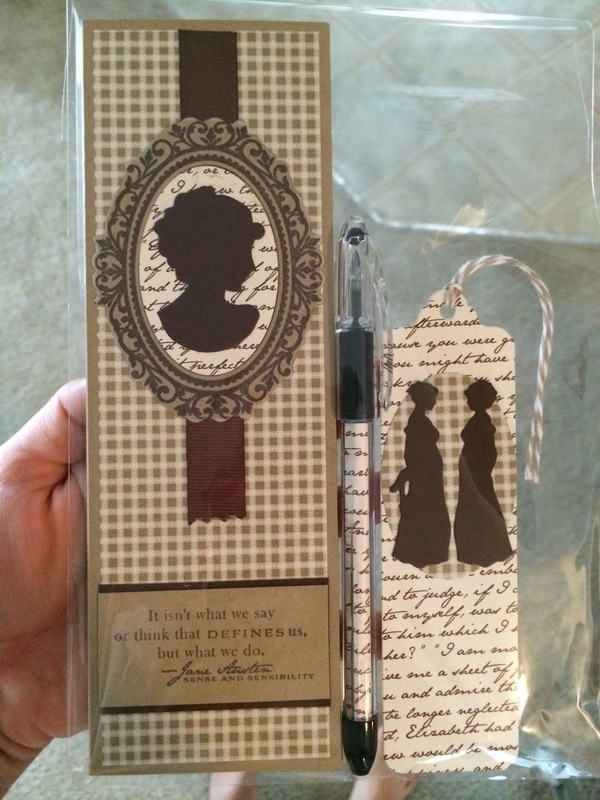 The Silhouette shapes were all bought from the Silhouette store: onlinesilhouettestore.com. I have a subscription there and LOVE their images. If you are interested, I could list which of the 6-7 cut files I used. And another with a different color scheme. They were so much fun to make and assemble! 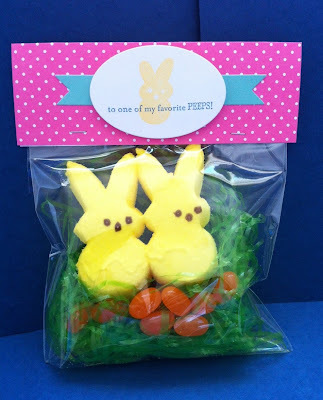 A tip for making these is to use ribbon not glue to hold them together. Despite the layers, I didn't have to use adhesive because I tied the ribbon tightly at the top. It's really a time saver! All of them lined up and ready to hand out! To tell a little bit more about what's been going on, last year both of my grandparents passed away. While growing up, they lived only a couple streets away from us, so they have really been like a second set of parents to my siblings and me. They were both truly amazing and caring people, and I'm so grateful they were in our lives. I'm also in the process of moving back to Florida. I haven't told many people about what's been going on, but it's a long, unfortunate story and without going into too many personal details, just Alexander and I will be moving down here for now. But after a long and hard year, I will say that things are starting to look much happier, so I have hope that things will get better. Hope you are doing well and keeping warm in this cold weather wherever you are. 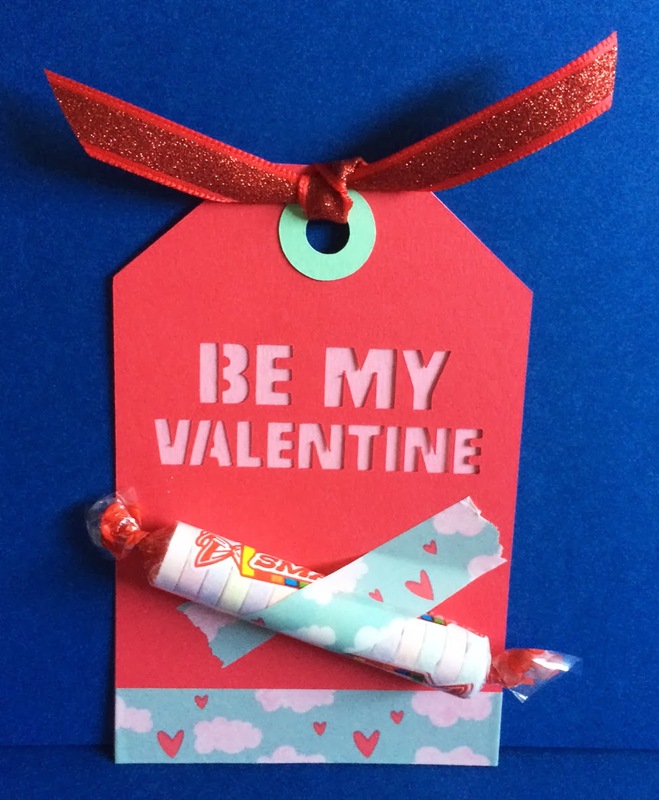 May you have a truly wonderful, sunny and a great Valentine's Day! 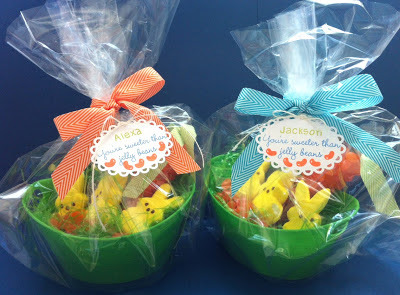 Yesterday I shared some bag topper treats and today I've got some easter basket treats I made for my niece and nephew. I've always loved to surprise them with special cards and treats during each holiday when I can. I used Lawn Fawn's Harold alphabet, to spell out their names. 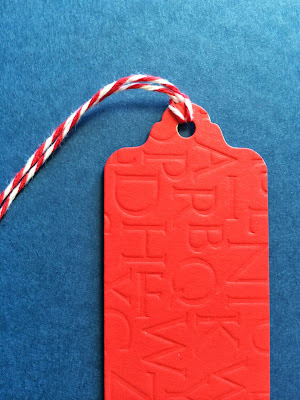 Just a tip, if you haven't tried them yet, Lawn Fawn has the BEST alphabet stamps. They were designed and cut out in a narrow, rectangle shape, so the letters line up perfectly next to one another. Give them a try if you have a chance, you will love them! 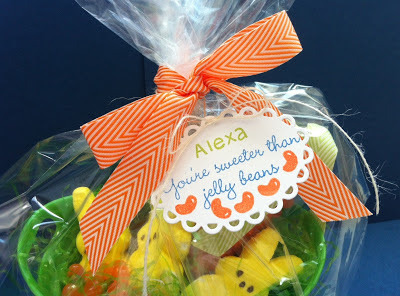 The "You're sweeter than jelly beans" sentiment and jellybeans image are from a My Cute Stamps set. 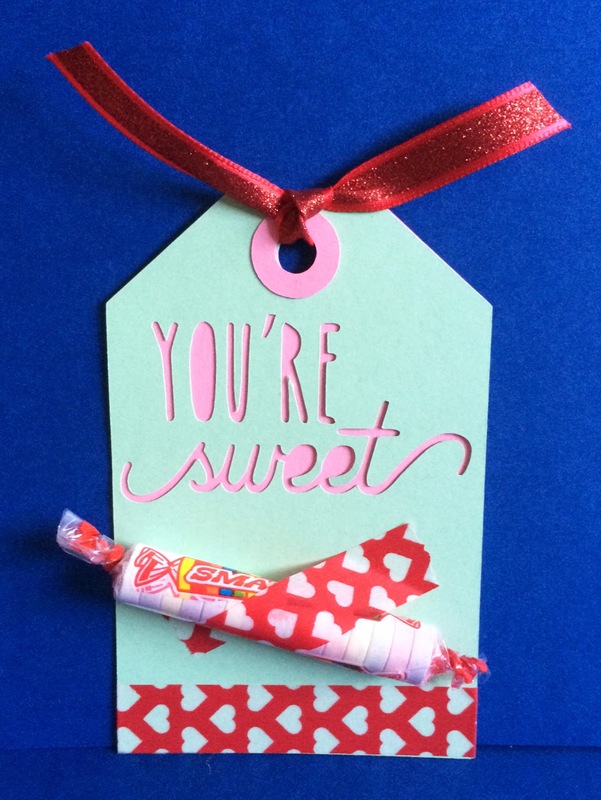 I can't get enough of these May Arts chevron ribbons too! A Muse sells those, and you can find them many other places as well. Here he is playing and cuddling with cousin Alexa. And playing ball with Jackson! Hello!! It has been so long since I've updated, and it seemed time to correct that finally with a new post! So sorry it's been so long. Life has been very hectic and overwhelming these past few months, traveling back and forth between Florida and Maryland quite a bit. My grandmother passed away and I was trying to spend as much time with her as I could in the final weeks and days. I'm glad a lot of family could be there to honor her and be there to support her. She has been the best, most kind grandma and I'm so glad to have had her influence and presence in my life. 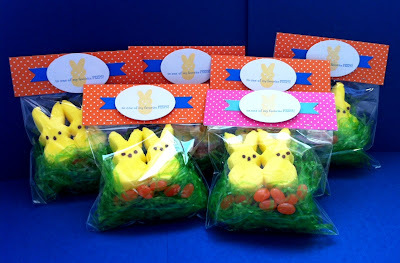 And today I'm sharing with you some Easter treats I made last year. 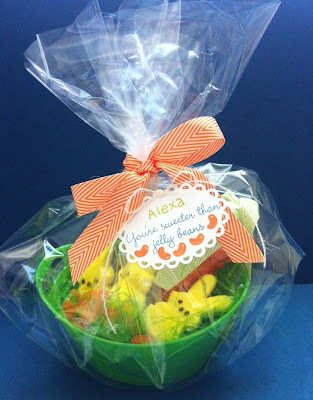 Making treats is one of my favorite crafty things to do. I used some A Muse stamps and inks. I made the topper using Petite polka dot orange cardstock and the A Muse Studio "For Peeps Sake" stamp set. And I made a pink version too. And here are the rest of them! Only 30 days until Easter! How did that happen so fast? 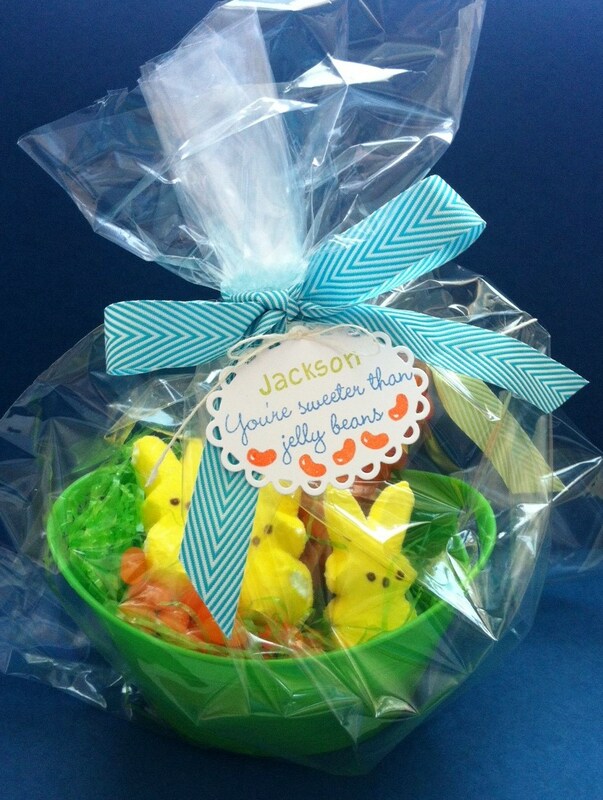 ;) Be back tomorrow with some treat baskets I made for my niece and nephew! The post is all ready to go! Happy Halloween!! :) Just wanted to share with you a simple Halloween card I made for a friend! We fortunately made it through the hurricane okay without losing power, and my thoughts are with those who are still dealing with the aftermath of this huge storm. Here is today's Halloween card. I used PTI's Limeade Ice patterned paper with a PTI Limitless Layers square scallop die and PTI Winter Wisteria ribbon. The stamp is from the dollar spot at Joann's. If you use pigment ink, then the acrylic stamps usually stamp okay. Have fun trick or treating and Happy Halloween everyone!! Hi there, thought I would pop in and share with you some monster treats I made! Hope your Halloween preparations are coming along well. Alexander has got a costume, but not sure if we'll be able to actually trick or treat with the hurricane headed our way, yikes! Praying that everything works out okay for everyone and that it's just a lot of rain. So onto the treats for today, Monster Munchies. Those mischevious monsters have teamed up and have broken into the treat bag to steal all the treats! :) The top monster is feeding a real candy corn to the other monster. And here's a peek at Alexander's costume this year. He is all decked out and ready for Halloween! Arr, arr matey! 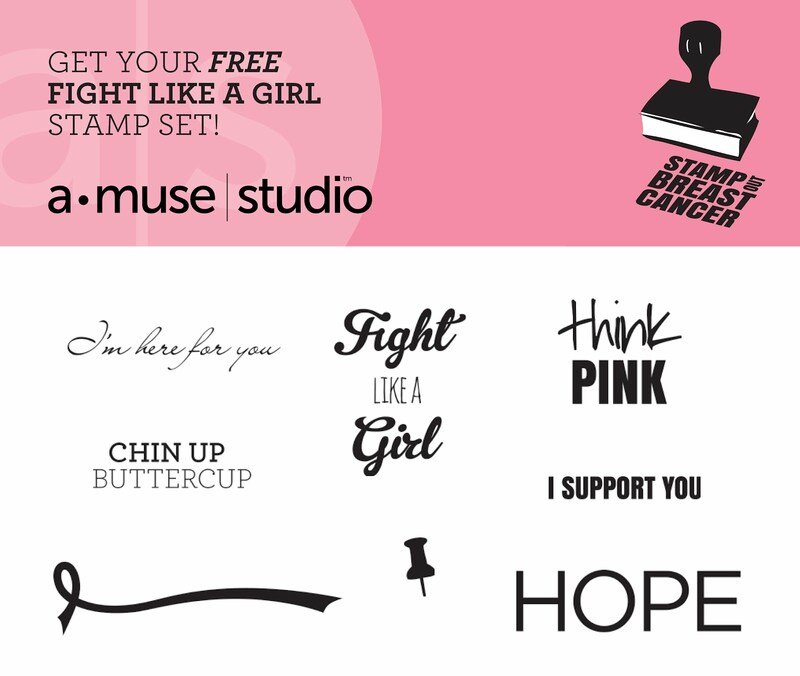 In honor of Breast Cancer Awareness month, A Muse Studio is giving away a FREE copy of the "Fight Like a Girl" stamp set (retail value: $18). It is an exclusive stamp set available only through October. They are available free to everyone, one per customer. There is a $3 shipping and handling charge and that's it! Also included in the package is: a 20% discount on a future purchase (expires Dec. 31), a postcard to be entered into a giveaway, and information about breast cancer awareness. I have been, like so many others, affected by breast cancer. My grandma passed away from breast cancer when I was 8 years old and she was only 61. Breast cancer awareness and prevention is so important. These stamps are perfect to cheer someone up and to encourage those who have or are currently trying to fight cancer! I’m a native of Florida, the Sunshine State, and I love to craft and create. Thanks for stopping by! Fable Friends Baby Card – Coffee and a Card Tomorrow! I started this blog as a way to share ideas, so feel free to use anything you find here. Just please link back to the post you were inspired by. Also, please don't submit for publication any exact copies of things here, since all work and ideas on this blog are copyrighted. Thanks!